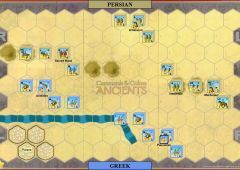 King Xerxes desired to punish the Athenians for his father’s defeat at Marathon and their support for Ionian revolts. He planned a second invasion of Greece in 480 BC and amassed a huge army to extend the Persian Empire into Europe. 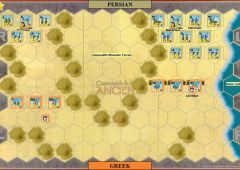 Several Greek citystates gathered around Athens and Sparta, and decided to slow the Persian advance at the narrow pass of Thermopylae. 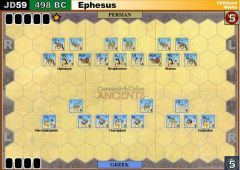 The Oracle at Delphi had announced that Sparta would either be destroyed or lose a King. Leonidas, one of the two Kings, chose the latter, leading 300 Spartans and other Greeks to one of History’s most famous last stands. 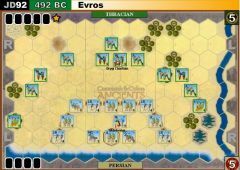 Xerxes waited four days for the small Greek force to leave. Then, for two and a half days he unleashed his army, wave after wave, against the Greek Hoplites who stood firm. 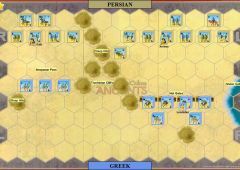 The Persians did not prevail until Ephialtes betrayed the Greeks by revealing a goat path that led behind their lines. 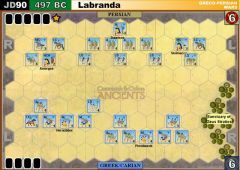 Dismissing the rest of the army, Leonidas fought to the death with his Spartans. Their epitaph reads: “Go tell the Spartans, stranger passing by, that here obedient to their laws we lie”. 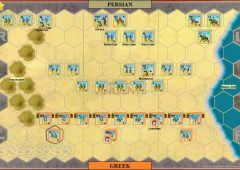 While a tactical victory, the heavy losses and the delay, inflicted by just a few hundred Greeks, was a significant blow to the Persian morale. 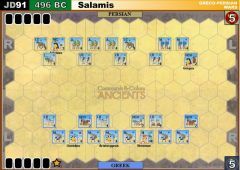 In September, the Greeks defeated the Persians at the naval battle of Salamis and Xerxes, fearful of being trapped in Europe, returned to Asia with part of his army. 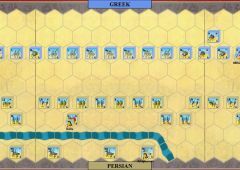 • When a Persian unit occupies the Greek camp hex or rampart hex at the start of his turn, remove the hex and gain 1 Victory Banner. 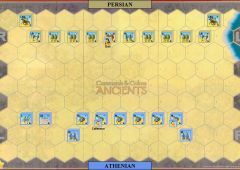 • The Hoplite Infantry rule is in effect. 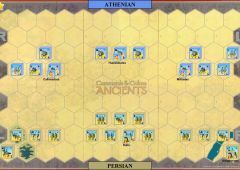 • Four Spartan units are special five bronze block MH units. • All hill hexes are impassable. 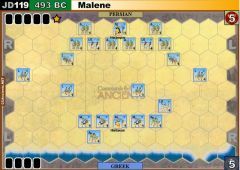 Passage through the Hills—When a Leadership card is played, Persian units and leaders on broken ground base line hexes may be ordered and moved to any Greek broken ground base line hexes (remove the units and leaders from the Persian broken ground baseline hexes and place them on vacant Greek broken ground baseline hexes). Ordered units may only battle (the passage through the hills counts as the movement for the turn), and if eligible may momentum advance and bonus close combat. How come I am no table to log any results at present? 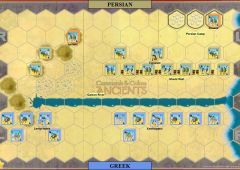 I wanted to add two victories for Persia. 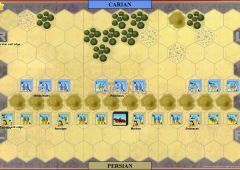 Just to clarify, can any Leader card be played by the Persians to trigger the flank marching special rule or only Inspired Right Leadership on the / Any Section? 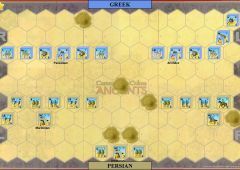 what happen if 2 or 3 greek units occupies the broken ground base line hexes, for example the A and LS, or Demophilus. \"\"and place them on vacant Greek broken ground baseline hexes\"\"
Only Hydarnes can go through the hills. 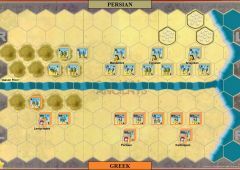 Imagine is a path of NO RETURN for the persians. 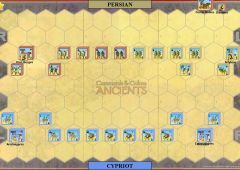 Imagine greeks units cant use the path. I just want to clarify that the Passage through the Hills rule is triggered by playing any Leadership card and not just the Leadership in Any Section or Right Section cards? 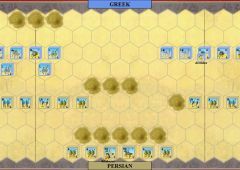 I guess the reasoning is to ensure a high chance that the Persians will be able to outflank the Spartan positions during the game. As does the film 300! Accounts of the battle do describe the Spartans attacking forward from the wall. 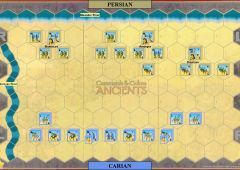 The Persians won the 2 games. 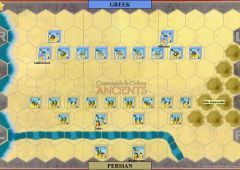 Greeks have to leave the wall to smash the Persians. 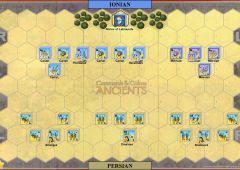 If they stand and wait, the Persians only have to shoot with their light troops to weak the hoplites. 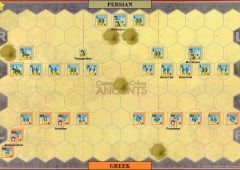 Better yet, if Sparta gets \"mounted charge\", play it and wipe out the front rank of Persian auxilia! 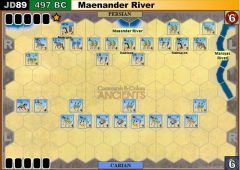 With the right cards, the Spartans can juggernaut across the map and destroy the Persians in an open fight. They don't need the wall! Strange scenario this one. 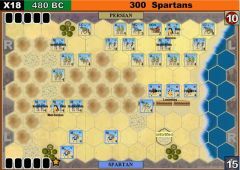 Why would the Spartans leave the defensive wall? 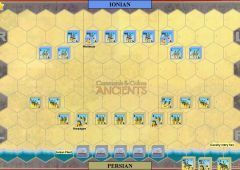 The Persians simply fire their (relatively) ineffective range combat troops at them and the game is a bit boring. Both sides seem to simply wait for the flanking attack to get the battle started. Hang on, isn't that what actually happened? 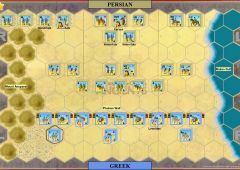 Perhaps a time limit should be applied to encourage the Persian infantry forward?